Wellington was in my sights today. I didn’t think I’d make it all the way in to town and was originally planning to get to Mt Kaukau, the highest point just outside Wellington, and stealth camp just before reaching the capital. I woke early this morning and was out the door by 6:30am. It was looking to be a big day and I didn’t want to muck around so hit the road straight away. From Moana Lodge I had a 2km walk to get back onto the trail. An uneventful 7km road section from Plimmerton to Porirua was straight up and the usual grumbles about road walking. I reached Porirua around 8:30am and grabbed some breakfast as the shops started opening for the day. Porirua was a bit bleak. The trail lead straight through a shopping mall precinct and the hustle and bustle of the morning motorist commute. I lost the path through the city a couple of times trying to pick up the Raiha Walkway but soon found it skirting around the back of factory buildings. This lead out towards Camp Elsdon and the start of a major climb up to Colonial Knob. The climb was tough. Ascending hundreds of stairs and gaining around 470m from sea level soon got the sweat pouring out and I was well saturated on reaching the top. But I couldn’t really stop. A stiff breeze was blowing from the west cost straight off the ocean and soon chilled me. Quite a bit different from the climb up, it was cold. The wind soon had me dry and I needed to pull another layer on. Views from the top of Colonial Hill were nice. I could see all the way back to Plimmerton, Porirua below and the suburbs of Wellington down to the south. Mount Kaukau, my next major landmark was also prominent to the south but a few hours off. Following the ridge tops down from Colonial Hill to Stirling forest was a battle against the wind. It didn’t look like easing up any. Hitting Stirling Forest it was back into the trees and bit of shelter from the wind. But very unpleasant on the nose as the stench from a major landfill below the forest kept wafting through the trees. The positive was the nicely benched and constructed trail down through the pines, with numerous switch backs to help save the knees. I took a quick drink break half way down the hill and Emily & Simon came along the trail. We played leap frog a bit as I over took them when they were having a break. Out of Stirling Forest it was back onto the roads. Another 6km dodging traffic on the narrow and relatively busy little roads. I was feeling peckish and needed some energy before the steep climb back up hill towards Mt Kaukau so stopped for lunch as I reached the start of Old Coach Road. Old Coach wound its way up onto the hill tops, following underneath the major power lines feeding Wellington. The wind was really roaring now and it at times it was a battle to stay up right. 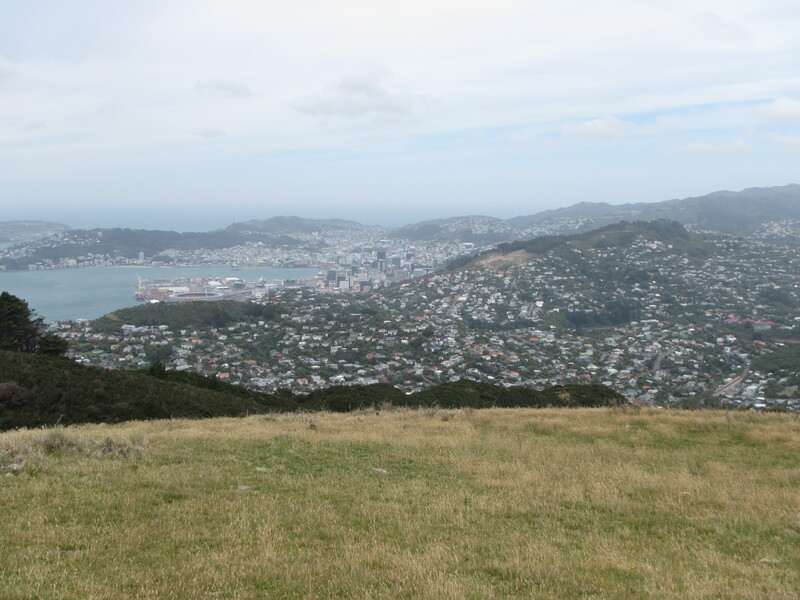 Just before reaching the summit, I came around a corner and caught my first glimse of Wellington below. This spurred me on and I reached the summit in the early afternoon. On a windless day I imagine spending some time up here overlooking the capotal and out to seas would be time well spent, but with near gale winds it wasn’t that great. At least the winds made decision making easy. At the start of the day I was intending to find a camp up here and walk into town tomorrow but the winds would have made it extremely uncomfortable. I think actually seeing the city also helped make the call to push on into town. I still had another 13km to reach the city centre and wasn’t sure I could make it but was determined to press on and see how far I could get. First though, I had another 2km on the exposed ridge tops before descending. The wind was horrific and I reckon I could have leaded back and it would have kept me upright. It was a battle for sure. Stronger than what we had experienced over the Taraua’s. It was knocking my walking poles about and a couple of times blew me right off the track into the scrub. Great decision not to stay up here. Finally at the end of the end of ridgeline the trail continued straight down into the outer suburbs of Wellington. Meandering through suburban streets was wierd and there were quite few odd looks at the silly bloke walking through streets with a backpack and walking poles. One fella asked me if I was going skiing. 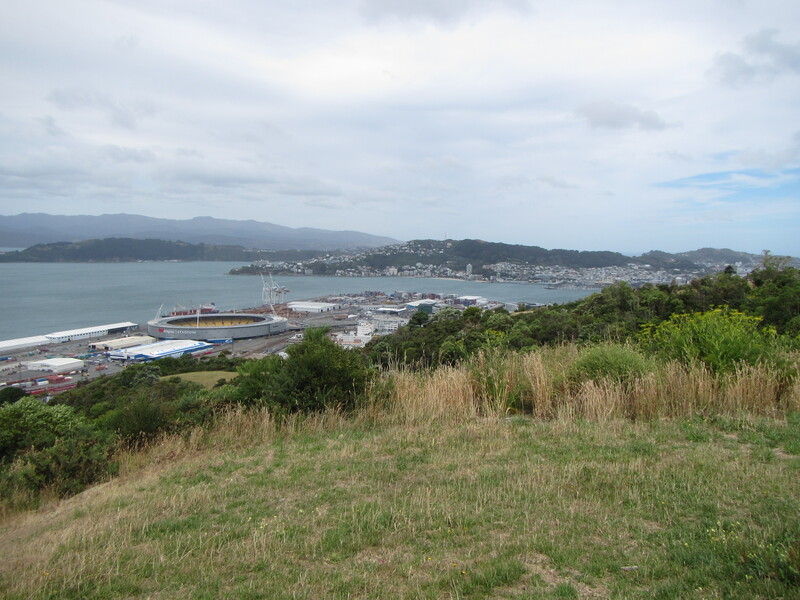 The 4 kilometres or ao through suburbs and urban parks was playing games with me, climbing up high then straight down and climbing up steep roads again as Te Araroa followed the Northern Walkway. The trail wound all over the place and it was difficult to get my bearings in relation to what direction of the compass I was on but I guess this is Te Araroa giving us a feel for the nature of the streets and housing in suburban Wellington. It wouldn’t be an easy place to navigate in a car either. Soon enough I reached Trelissick Park just to the north of the city centre and continued on the Northern Walkway. By now time was getting away and my feet were feeling the 34 kms already walked. Seeing the city up close and from a high vantage point spurred me on. There would be no camping tonight and I definatley had another 3km in me to reach the city limits. I kept plugging away for the final 3 km until hitting the wall and St Mary’s road, just outside the botantic gardens. I was spent and realised I wouldn’t make it all the way into the city today. As it happened though I found a nice pub 100m off trail which had a vacancy and I grabbed it. It was a massive day but I was eleated. I’d reached Wellington a day earlier than expected. I now had plenty of time to complete the trail to the bottom of the north island tomorrow and wouldn’t have to cram in the walk and trying to get food drops organised for the south island, on what was supposed to be a two day break in Wellington, my first two day break since beginning in mid November. I would finish the north island tomorrow. woohooo bye bye north hello south. another awesome milestone!